Dance education offers children a chance for both artistry and athleticism. In the right dance school, dance offers children the perfect opportunity for emotional development in both self-esteem and joy. Look for teachers that are trained to teach. The best teachers may not be the best dancers, but their talents to teach and inspire are remarkable. A degree in dance education is a good sign of a professional teacher at a dance school. When selecting a teacher for young dancers (age 6 and younger), a teacher’s ability to engage and relate to the age group is imperative. Often, a mother makes the best teacher of the tiniest dancers from their hands on experience. For older dancers, an experienced teacher is essential to developing proper technique in all disciplines of dance. Often teachers push young dancers into pointe shoes before their bodies are developmentally ready. Point work before ready can lead to major injuries and development issues, as well as really bad dance habits. Corrections are an essential part of a dance education and dance school. Positive reinforcement is very motivating to young dancers as is goal setting and recognition of accomplishments. Look for an atmosphere that is child appropriate in a dance school Are their scarves, bean bags, etc. for young dancers? Is the music engaging and lively? Is there a variety of music? Is there a variety of dance styles offered so dancers can achieve a balanced dance education? Is the studio warm and inviting? The relationship between a dance teacher and a student is also an important part of the process. A teacher who knows each student’s name early in the season and offers a warm greeting likely has a great rapport with her students. How about the kids? Are the dancers experiencing the joy of dance? Technique is essential to a dancer’s development, but if the class was not enjoyable, chances are the dancer will not return the following season. Are there students who have continued for years? Are they excited to come to dance school? Are there programs available for more advanced dancers? Are there performance opportunities for ALL dancers – not just the most experienced? Asking a dancer to take a class without performing, is like running drills for soccer, but never playing a game! A quality school will integrate all of the technical skills in the curriculum for the level and style of dance into a well-choreographed dance for an end of the year performance. The end of year performance or recital is a celebration of the accomplishments of the year, as well as a showcase for talent. Done right, it is a wonderful experience that builds tremendous confidence, perseverance, and appreciation for hard work! By making the technical skills part of the recital performance, we can ensure that the dancers are learning and accomplishing the goals for the year. By keeping each section of the recital short, we can offer the audience an enjoyable performance as well. Performance also teaches students how to turn a concept into reality. 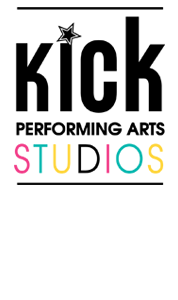 To learn about Kick Dance Studios classes, click here.